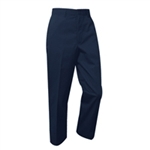 Mens navy work pants are 65/35% poly/cotton. Inset rear pockets. 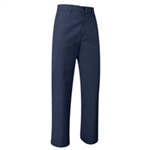 Sized by waist 28-38 even and odd waist sizes, 40-56 even only. Please specify length for hemming.